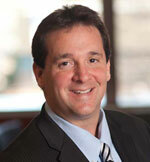 Robert Goldfeder is responsible for leasing and marketing all properties in Basser-Kaufman’s considerable portfolio. He has been with the company in this role since early 2000. Mr. Goldfeder is involved in every tenant negotiation from start to finish. He reviews existing vacancies, considers which retailers might be a good fit for a particular property, and reaches out to key decision makers. Along with Principals Steven Kaufman and Marc Kemp, he negotiates with tenants and works with them throughout the leasing process. Sometimes, a retailer is such a natural fit for a particular Basser-Kaufman property, the deal comes easily. But the most interesting projects, he says, are those that require strategic thinking — identifying the perfect tenant for a particular property, then reaching out to that retailer and generating interest. The retailer gets an ideal location and Basser-Kaufman gains a tenant. “I love the thrill of making a deal!” says Mr. Goldfeder. Basser-Kaufman has much to offer potential clients, Mr. Goldfeder explains. In addition to a large portfolio of well-positioned real estate, the company has an excellent reputation for very fair leasing deals, doing business with honesty and integrity, and the ability and desire to get things done quickly. Prior to joining Basser-Kaufman, Mr. Goldfeder worked as a broker at Welco Realty and as a manager at Chase Manhattan Bank. He is a graduate of Queens College. Mr. Goldfeder is a proud member of the International Council of Shopping Centers (ICSC).